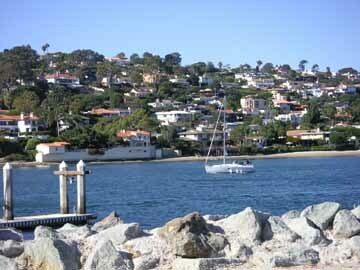 Shelter Island, named for the protection it gives to yachts and small boats against southerly and southeasterly winds, is the home of yacht clubs, sportfishing boats, public moorings, launching ramps, motels, restaurants, yacht-brokers, ship chandlers, public parks, and superb views of the city and San Diego Bay. Connected to the mainland by a causeway (and therefore not really an island at all), it is immensely popular with both visitors and residents, and a delightful place to explore on foot. Once, for a period lasting at least a million years, it was nothing more than a mud bank, a submerged shoal, lying off Point Loma. In 1934, however, the City of San Diego began dredging the bay and dumped some of the surplus material on the shoal. Similar additions occurred in the late '30's and in the '40's. In 1950 the City added a 2000-foot causeway, along with enough dredgings to raise the former mud bank comfortably above sea level, began landscaping the island with palm trees, and allowed commercial development to begin. 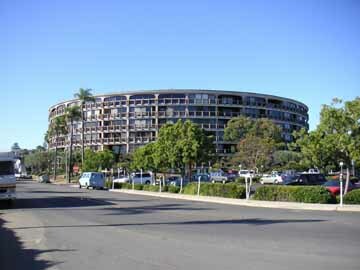 This walking tour is especially nice on a Saturday or Sunday, for then San Diego Bay is speckled with small sailboats, the launching ramps are busily catering to motorboats, and the park along the bay is bustling with picnickers. But on a weekday you will find a lot of activity in the marine yards, so take your pick. Either way, you're in for a pleasant adventure. Distance: Two miles. Time: An hour and a half. Note: This walk does not bring you back to your starting point, so plan either to walk or to take a taxi back. 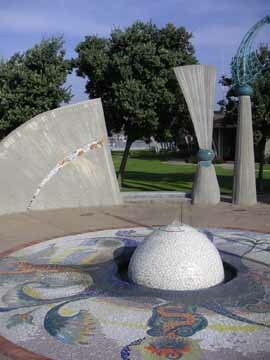 Begin your walking tour at the Bell of Friendship, at the tip of Shelter Island. This bell, weighing two and a half tons, hangs in an open wooden building with a Buddhist motif. 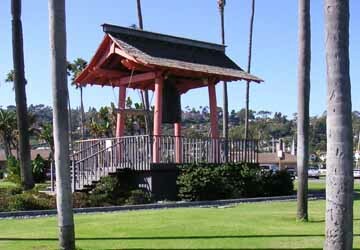 It was presented to San Diego in 1960 by her "sister city," Yokohama, Japan. Walk across the road, past the Harbor Police building, to the shoreline. Looking across the water you can see the Riviera-like homes of the La Playa district of Point Loma. The blue ships usually seen just south of La Playa are research vessels of the Scripps Institution of Oceanography. A little farther south is a Navy research station. You can see out past the entrance to San Diego Bay to the Pacific Ocean. Across the entrance to the bay is North Island Naval Air Station. Look for its fleet of planes on the ground. 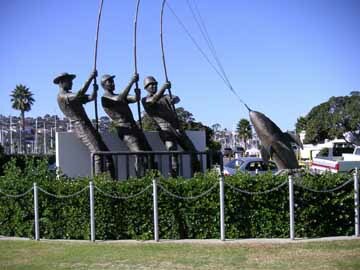 Before long you come to the Tunaman's Memorial, a handsome bronze sculpture of three fishermen working to bring in a catch. Beyond the memorial is a children's playground, and then the popular Shelter Island Fishing Pier. Take a walk out on the pier to see what's being caught. As you continue your walk, a strip of sand soon appears and becomes a fine bathing beach. The beach and the grass are particularly popular on weekends. At the end of the beach, walk out on the spit that encloses the Shelter Island Launching Ramp, and watch the busy skippers sliding their small motorboats and sailboats into or out of the water. Continuing on, you pass the Shelter Island Gazebo, also designed by local artist James Hubbell. Rounding the tip of Shelter Island, you now walk southwest. 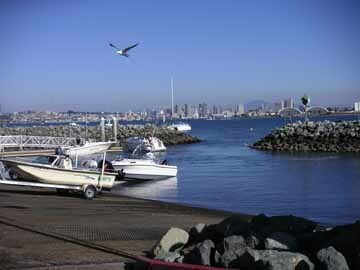 The boats of Shelter Cove Marina remind you that San Diego is one of the yachting meccas of the United States. Just before you reach the traffic circle, a small, sturdy pier provides a good spot from which to survey the boats. 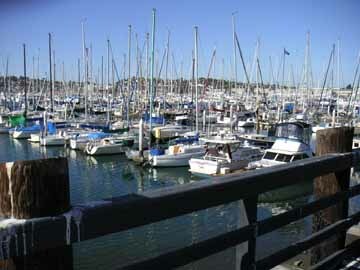 This area is called America's Cup Harbor, in honor of the America's Cup yacht races held in the Pacific Ocean off San Diego in 1988, 1992, and 1995. Leaving the pier, walk a few yards farther, and then go around to the right on Shelter Island Drive. Shelter Island Drive is lined with small shops that sell and repair yachts. Stop at the edge of a marine repair yard to see the boats in dry dock for repairs, and go into some of the sales offices to look at the new yachts. On the left side of the road you will find the weighing station of The Marlin Club. The marlin season runs from late July to early November. During these months the scales are put to heavy use when the marlin boats come back to port with their catches in the late afternoon. A good-sized marlin weighs 150 pounds and, including its sword, is six to seven feet long. Turn left at Anchorage Lane. On your right, the round Le Rondelet condominiums sit on the site once occupied by a Starkist tuna factory. Turn right at Cañon Street, and right again at Shafter Street. 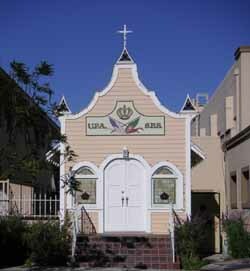 Take a few steps on Avenida de Portugal to see two buildings of the Portuguese community -- a tiny wood frame chapel and the large United Portuguese S.E.S. meeting hall. The hall is used regularly for Portuguese social functions, religious celebrations, and wedding parties. Painted above the doorway are United States and Portuguese flags. The letters S. E. S. stand for Sociedade do Espírito Santo, Society of the Holy Spirit. The chapel is used only on special occasions, such as the Festa do Espírito Santo, Feast of the Holy Spirit. This celebration is held every year on Pentecost Sunday, seven weeks after Easter. The festa features a parade that begins at the chapel, proceeds to the nearby Catholic church for mass, then returns to the chapel for an afternoon of feasting, singing, and dancing. The food includes home-made wine and a special Portuguese sweet bread flavored with lemons and mint. If you are taking this walk on a Saturday afternoon, you might want to stop in at the Portuguese Historical Center, on the left a few steps farther up the street. Return to Shafter Street, and continue along it. Crossing Shelter Island Drive, you come to a block of yacht outfitters. Go left at Carleton Street, right at Scott Street, then right again at Dickens Street. Turn left into the parking lot at the end of Dickens, and continue out to the water. Walk left along the sea wall. In a moment you will find the docks and offices of several sportfishing companies. If you like sportfishing, you might stop to arrange a fishing trip. Alternatively, you may be able to schedule a whale-watching trip. From December through March, day trips take whale viewers out to watch whales as they make their way past Point Loma. 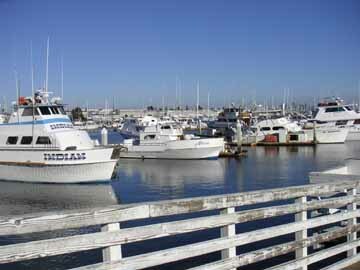 In any case, end your walk by going out onto the docks to look at the fishing boats.